I have canceled my promotion quest given from Master warrak (3rd class of fighter) by my mistake. I think that its requirement was collecting some tomes (4,5 and 250 Literacy with 50 LVL). If there is any Crucible admin, Please help me solve my problem. My character name is 'Shitter'. btw, how can i contact crucible admin? i checked RPGCrucible website but i couldn't find any contact route like Email. I have lots of question about the game, but theres no player except me. Last edited by juggernaut on Fri Feb 01, 2019 2:42 am, edited 1 time in total. Re: Is any RPG Crucible admin here? By the way, why is DPS of piercing weapons far stronger than DPS of slashing weapons? i compared Keen Rapier(pierce) with Keen Halberd(slash) got from each master. ▲ I upgraded Keen Halberd to Honned Halberd but it is still weaker than Rare piercing weapon. As you see , both are from Masters. However, Piercing weapon is much stronger than slashing one even though they have equal requirements and same quality. i'm wondering what caused this large gap. Last edited by juggernaut on Thu Jan 31, 2019 1:41 pm, edited 1 time in total. Plus, what is the effect of Brawling and Cleave? I think they don't do such as reducing cool down or increase damage. i felt #brawl and #cleave works regardless of the its figure. Brawling and Cleave (and other extra special attacks) have a high base chance to hit. Cleave can only be used with slashing and it will sometimes cause bleeding. Brawl is an extra attack that can be used with any melee weapon. The cooldown does in fact get lower with the higher skill you have, it gets a lot more noticeable the higher your skill gets. Higher chance to hit goes along with skill too. As for the weapon, you need to look at the modifiers that the weapon rolled when it was created. 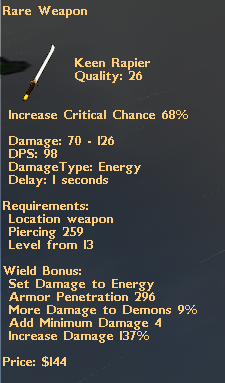 The big difference in those weapons is the <Increase Damage 137%> on the Rapier which boosts its damage by a lot. Some modifiers are "local" to the weapon like the increase damage while others are global modifiers to your character (ie More damage to Demons). As for your character quest being bugged I may have to look at your character file (Phantom currently hosts Crucible so he has access to these files). 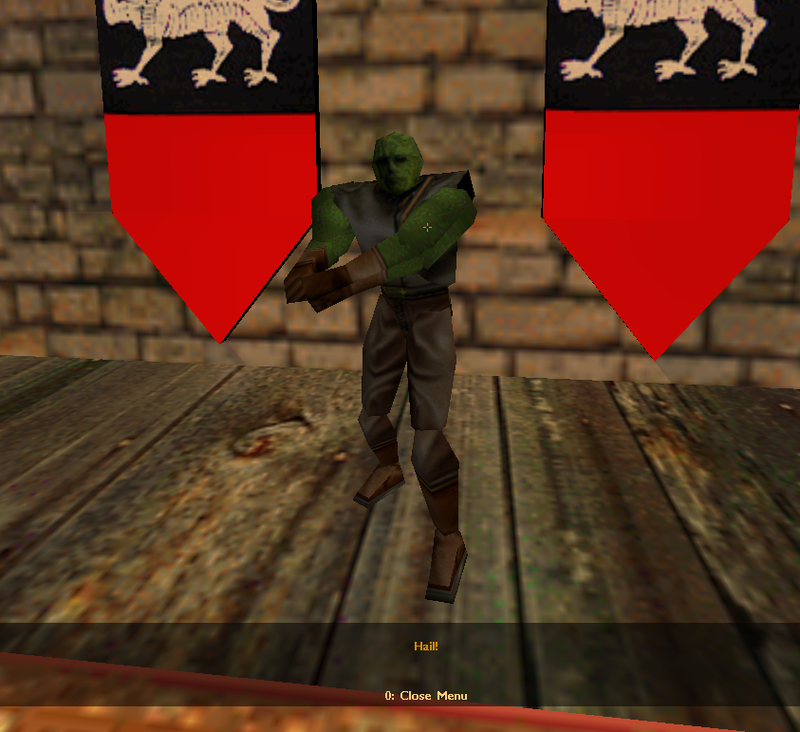 I *thought* I made it so if you cancel your quest you can just restart the quest again by getting another Forest Tome Vol 1 from the starting goblin area, and then going to one of the masters. unfortunately, i gave up my character, Shitter. because of its bugs. so i made new char named 'Juggernaut' again. 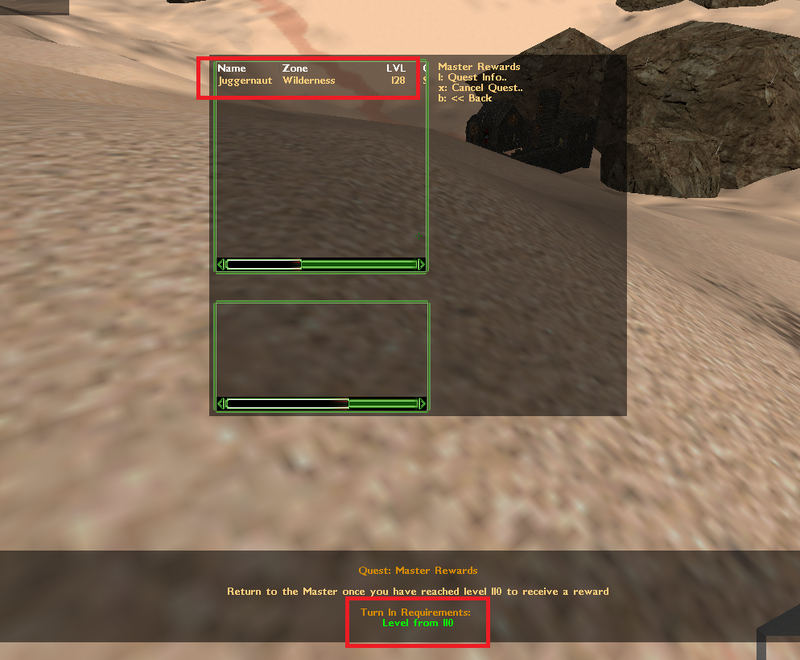 sadly this char got bugged too and this time cause is not my fault..
you will understand after you see pictures below. as you see this picture, i have just met the requirement of quest. 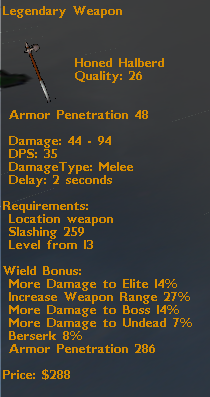 Plus, what does the 'Armor penetration' exactly do? does the 'Accuracy' work only with ranged weapons?